You'll be in rock-and-roll paradise with Guitar Hero World Tour. The game has advanced modes, options and tools for your rocking pleasure. Enjoy a vast amount of master recordings from some of the biggest acts of all time, including Van Halen, Linkin Park, the Eagles, Sublime and more. The game will also offer significantly more localized downloadable music than ever before. 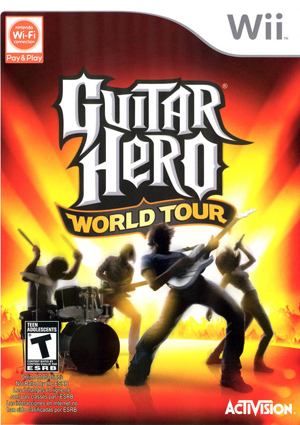 Guitar Hero World Tour gives you creative license to fully customize everything from characters' appearances and instruments to the band's logo and album covers. The innovative Music Studio lets you compose, record, edit and share music. The hard-hitting Battle of the Bands mode lets up to eight players get in on the mayhem. Jam like a pro and show off your talents like a true superstar. Video has subtle corruptions (miss colored lines, etc.). Using the Force Texture Filtering enhancement will severely corrupt cinematics. The graph below charts the compatibility with Guitar Hero World Tour since Dolphin's 2.0 release, listing revisions only where a compatibility change occurred. 3.5 Windows 7 Intel Core i7-920 @ 3.2GHz NVIDIA GeForce GTX 670 Menu OK, nothing in sync though. Lot of input lag.